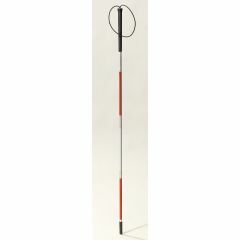 Blind Folding Cane by Drive Medical is a four quality section aluminum cane. It is wrapped in red and white reflective tape for added visibility during the day and night. It measures 46.25" in length and has a reinforced tip for added durability. This product is also backed by Drive Medical's Limited Lifetime Warranty. I think this will be a big help. How does this cane fold up?